In order for CRM users that are not system administrators to be able to use PowerScore, they will need to be assigned to one of the PowerScore security roles that are automatically imported into the CRM. 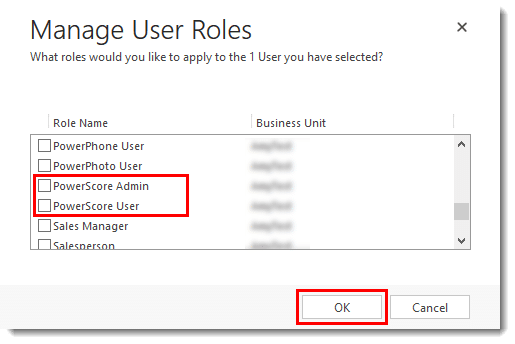 The PowerScore Admin security role will allow users to do everything related to PowerScore, including: creating new scoring rules and viewing scores. The PowerScore User security role will allow users to view scores, but not to create new scoring rules. 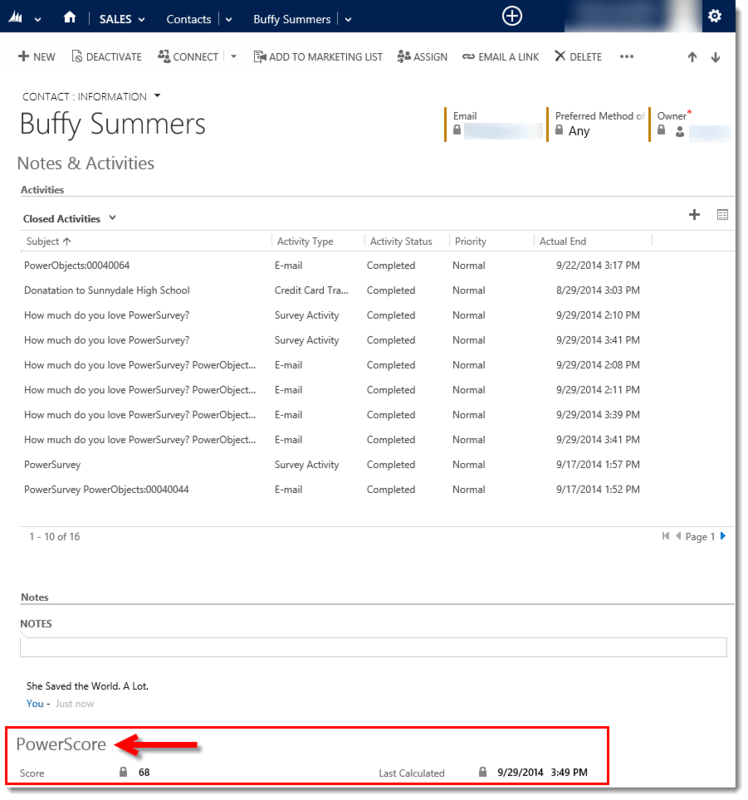 Once you have imported and registered the PowerScore solution for your Microsoft Dynamics CRM system it will need to be configured. To configure PowerScore navigate to to Settings > Solutions and double click on PowerScore. Click on the PowerScore Configuration tab to configure your settings. Make sure to save your settings when you are finished. If you need to reset the changes you made to this tab back to the default settings, click reset and then save. An individual person’s score is updated each time a PowerScore is created, related to them. The contacts/leads without activity will have their score drop off over time. We don’t want to check the entire database of contacts/leads for old scores every time a score-able activity happens. By setting a freshness value (in days), we know we need to check the database for old scores of those contacts/leads without recent transactions within that past x number of days. If the transactions on that record are older than the number of days defined in the “period” row, we will age them. This number (in days) tells us how long a particular score is valid. For example, if someone fills out a web form, that person gets a score. The period tells us how long that score is valid for. After the period, the score is no longer valid, and will not be included in the total score for that lead or contact. This is the number (in minutes) between freshness checks. For example, if we have not checked for records that are older than the freshness in the last 30 minutes, check now. When we go through the database to update old scores (leads/contacts that haven’t had any score transactions in the number of days defined in the freshness row), we may get a very large number of records. The number entered in the “process top” row will be the number of records that are processed in each call. To begin using the PowerScore add-on, the first step is to set-up some scoring rules, to decide what types of behaviors you’d like to score based on. 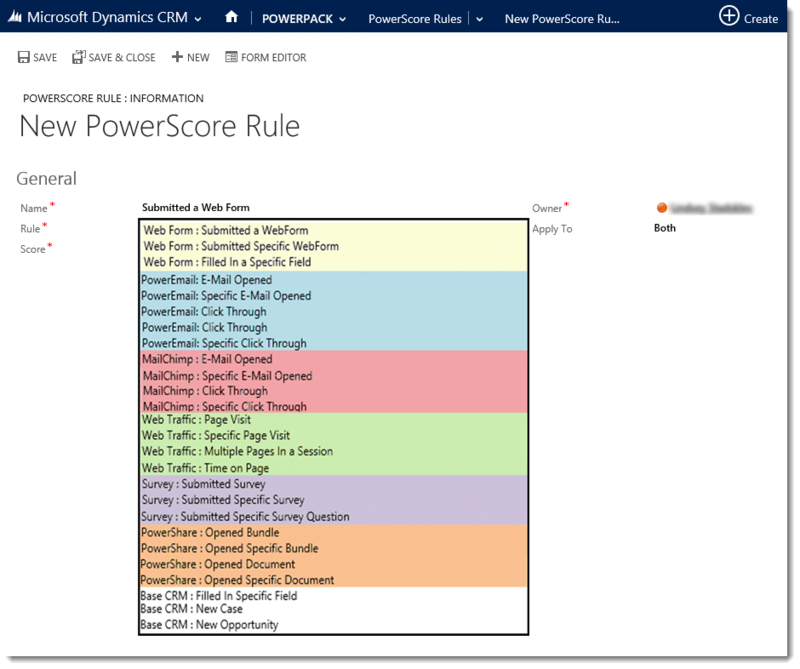 To start creating scores, navigate to the PowerPack > PowerScore Rules and click New. Rule: The behavior that scoring is based is called a Rule. This will specify what Add-On is being used to score the contact and/or lead. Score: This should be a numerical value based on the scoring system you have set up. The Score needs to be a whole number but may be positive or negative. These are the rules that the scores are based on. Many of these rules depend on PowerObjects’ other PowerPack Add-ons. If you do not have the respective add-on in CRM, that particular group of scores will not be able to be used. Scores can be positive or negative numeric values; the score must also must a whole number. 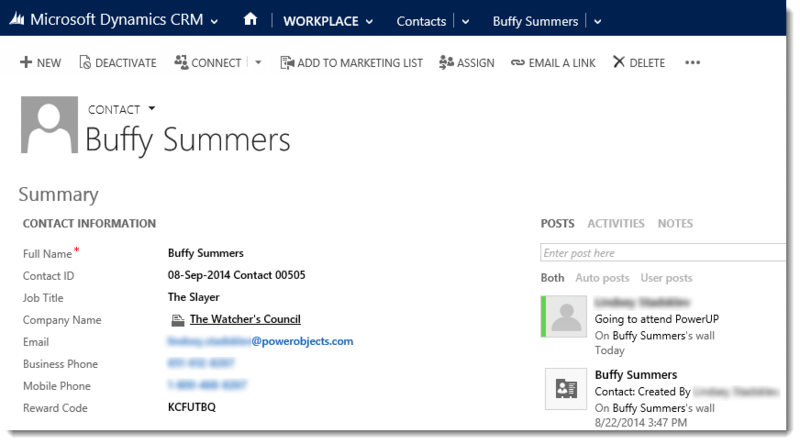 These rules are based on the PowerWebForm add-on. Rules can be created based on the submission of any form, the submission of a specific form, or when a specific field on a web form has been filled in. These rules are based on the PowerEmail add-on. Rules can be created based on ANY email being opened, a specific email being opened, any link in an email being clicked on, or a specific link in an email being clicked on. These rules are based on the PowerMailChimp add-on. Rules can score a lead and/or contact when any bulk email is opened, when a specific bulk email is opened, when any link in a bulk email is clicked on, or when a specific link in a bulk email is clicked on. These rules are based on the PowerWebTraffic add-on. Rules can be created based on a contact or lead visiting any page on your website, visiting a specific page, visiting multiple pages in one session, and the amount of time they spent on a page. These rules are based on the PowerSurvey add-on. A lead and/or contact can be scored based on the completion of any survey, the completion of a specific survey, or the submission of a specific survey question. These rules are based on the PowerShare add-on. Scores can be generated based on the open of any bundle of documents, the open of a specific bundle of documents, the open of any document in the bundle, and the open of a specific document in the bundle. These rules are based on inherent CRM functionality. Rules can be created based on a specific field being filled in for a lead or contact, a new case, or new opportunity being created related to a contact. 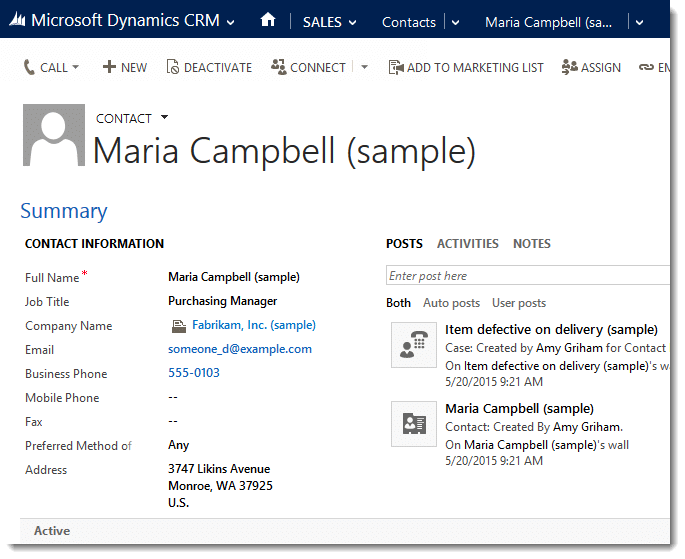 If you do not have the PowerWebForm, PowerEmail, PowerMailChimp, PowerWebTraffic, PowerSurvey, or PowerShare add-ons in your CRM, those rules will not be enabled. If you are interested in learning more about these other add-ons, please visit the PowerPack webpage. To disable a scoring rule that has been previously created, deactivate the PowerScore Rule and it will stop scoring. Simply select the rule in question and click deactivate. When the specifications of a scoring rule has been met (for example, a new case has been created and set regarding a contact), a PowerScore record will be created and appended to that contact. To see the totaled score for a specific Contact/Lead and when that score was last calculated, begin by navigating to the record in question. Click on the drop down arrow to the right of the record name. Select the Information form. Scroll down the form, under Notes, to PowerScore. The scores will be displayed here. There are two different places to view PowerScores: Via PowerPack or via the record the score pertains to. The view that opens will display: what score was executed (Score Rule Name), who the score was related to (Contact or Lead), what value was tied to that score (Score), and when the activity happened (Event Date). 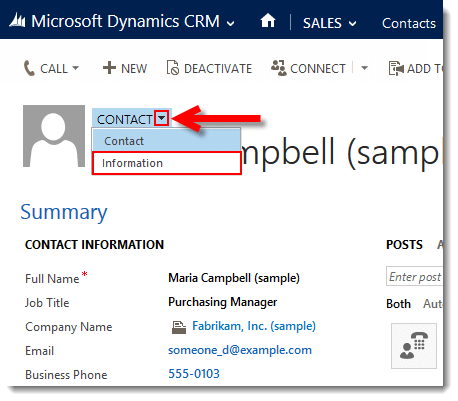 Navigate to a Contact or Lead Record. On the top navigation bar, hover over the chevron next to the name of the record; select PowerScores. It may be necessary to scroll to the right to find the selection. The view that opens will display: what score was executed (Score Rule Name), when the activity happened (Event Date), and what value was tied to that score (Score). One unique feature of the PowerScore add-on is that you can age the scores. For example, let’s say that a lead had tons of score-able behavior for a few weeks; they fill out web forms, submitted surveys, and navigated all over your website. They have probably racked up a huge score! However, now this lead hasn’t had any score-able behavior for the past 3 months. Those scores probably aren’t still relevant as they happened so long ago. 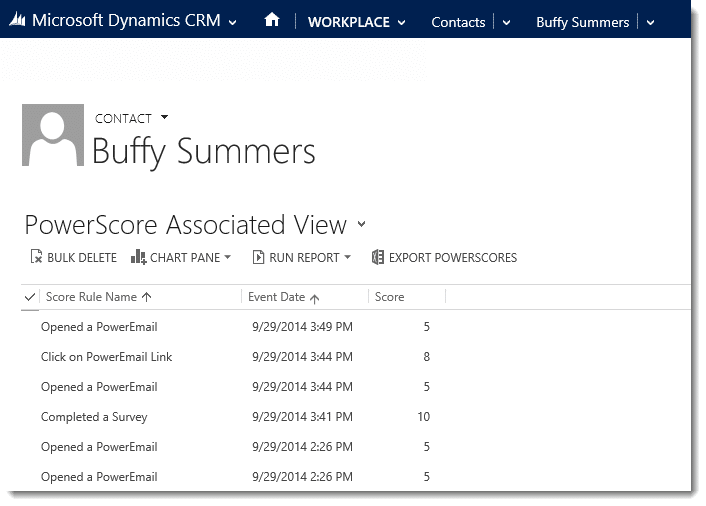 PowerScore gives CRM users the ability to “age” their score, or wipe a score clean after a certain amount of time. The CRM Admin can decide how long before a score gets stale in the PowerScore setup, in the “Freshness” column. Please see the PowerScore import guide for more details. To uninstall, first delete any PowerScore Rules you have created. Then uninstall as usual, by deleting the solution. Deleting the PowerScore Rules removes SDK Message Processing Steps that would otherwise block the uninstall. Thank you for your interest in PowerScore, should you choose to subscribe you will be charged $1/enabled CRM user/month. If you have any questions or run into any issues with PowerScore, our friendly support team is here to help!